Did you get an ORA-06512 error when running an SQL query? Learn what this error is and how to resolve it in this article. Where n is a line number. This ORA-06512: At Line error message is a generic PL/SQL error message that happens when an exception is not handled. When an error message is displayed, a stack trace is also shown, which shows the sequence of calls made to the database by the code. There might be several lines here, and one of them will be the ORA-06512 error. So, how do you resolve it? Add an exception handler to your PL/SQL code. I’ll show an example of this error, and how to resolve it using both of these errors in this article. This is a simple procedure that sets a variable. If we run the statement to create the procedure, there is no issue. 06502. 00000 -  "PL/SQL: numeric or value error%s"
EXEC TestOutput; Error starting at line : 8 in command - EXEC TestOutput Error report - ORA-06502: PL/SQL: numeric or value error: character string buffer too small ORA-06512: at "SYSTEM.TESTOUTPUT", line 4 ORA-06512: at line 1 06502. 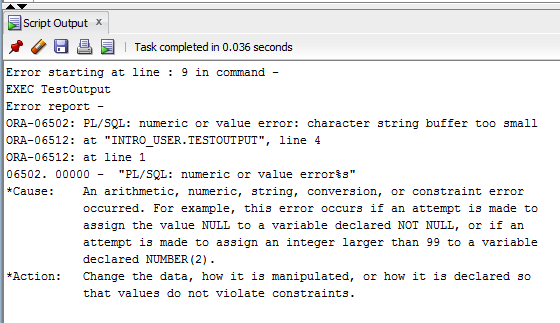 00000 - "PL/SQL: numeric or value error%s" *Cause: An arithmetic, numeric, string, conversion, or constraint error occurred. For example, this error occurs if an attempt is made to assign the value NULL to a variable declared NOT NULL, or if an attempt is made to assign an integer larger than 99 to a variable declared NUMBER(2). *Action: Change the data, how it is manipulated, or how it is declared so that values do not violate constraints. It gives us an error that wasn’t found when it was compiled. However, the actual error that occurred is further up in the message. If we resolve this error, then the ORA-06512 should also disappear. Let’s take a look at the procedure. It looks like the error is being triggered on line 4, where pName is being initialised. It’s happening because the pName variable is 5 characters long, but the variable is 6 characters. We can resolve this in two ways. First, we can adjust the size of the variable. I’ve increased pName from 5 to 6 characters to handle the value of “Steven”. Or, we can add an exception handler. This will mean that any errors that are found are treated in a certain way. Let’s say if the value is over 5 characters then we trim it to 5 characters. If we run this procedure now, then the error does not appear. Are you getting this specific error message, which mentions the sys.utl_file package? This is most likely happening because of a permissions issue when exporting a file to a directory. This question on StackExchange and this question on StackOverflow are a couple of examples. Make sure the user that is running the procedure has write access to the directory you’re mentioning. Double check this – as it can often seem like the right permissions are defined but they are not. Check that the directory is correct. It often needs a trailing slash, or if using a network directory, the full path might be needed. So, in summary, the ORA-06512 error appears because there is an unhandled error in the PL/SQL code being called. To resolve it, either fix the error in the code or add an exception handler.